HAVANA (AP)—Lazaro Perez jabs rhythmically at his rival in a steamy Havana gym, dancing, feinting and punctuating each blow with a grunt. After the final bell, he thrusts a weary arm skyward in triumph, and a proud smile spreads across a face still years from feeling a razor’s scrape. Perez has just become Havana’s first under-75-pound (34-kilogram) boxing champion in a new age category for 9- and 10-year-olds. Boxing-mad Cuba is putting its athletes in the ring earlier than ever. The idea is that those who start young will have a critical edge in the sport’s motions and techniques when they start competing more seriously down the road. It’s part of a top-to-bottom shake-up aimed at restoring Cuban boxing to its former glory after the national squad returned from the 2008 Summer Olympics in Beijing without a gold medal for the first time in 40 years. It’s not uncommon for children this age to enter the ring these days. The International Boxing Association sanctions competitive boxing for 15 years and up, but lets national federations set their own rules for younger children. A spokeswoman for USA Boxing said competition starts at 8 years old in the United States, and many begin training at 7. Since competition in Cuba’s new age class began last year, hundreds of boys have been boxing in tournaments like the Jan. 21 city championship at the Rafael Trejo gym in Old Havana, with its splintering wood bleachers and discolored walls. There are strict rules to keep competition safe for the preadolescent pugilists. A doctor examines them before each fight and referees watch the action closely. Bouts are limited to three 50-second rounds. Only straight punches are allowed, and fighters are supposed to keep their distance. Headgear is mandatory, as in all organized amateur boxing. It’s a far cry from the “Rumble in the Jungle” or the “Thrilla in Manila,” but don’t tell that to the kids, or to the parents who crowd the stands and cheer each bout like an Olympic final. Perez’s father, also named Lazaro, yelled encouragement and advice to his son during the title match: “Let’s go!” “Get him!” “Watch your defense!” he cried, head bobbing and fists pumping as if he were in the ring himself. “Right here is the future of Cuban boxing,” the elder Perez said. Amateur boxing is second only to baseball as a national sport in Cuba, and it’s a point of pride among islanders that their country of 11 million people usually punches above its weight in medal counts during international competitions. But the island’s economic difficulties keep the Boxing Federation from funding its programs at the levels other countries do, and make it hard to replace decrepit equipment and facilities. Meanwhile, some top fighters have defected to turn pro, including Olympic and world champions Gamboa and Guillermo Rigondeaux, sapping the national team of experience and talent. Four years after Cuban boxers won five gold medals at the Athens Olympics came the Beijing fiasco. Cuba had another subpar performance at the World Championships in Italy the following year, and hit rock-bottom in 2010 at the Panamerican Championships, when host Ecuador toppled Cuba from its long-held throne as best in Latin America. Humiliated sports authorities vowed a total overhaul to get Cuban boxing back on track. The first move was to bring in a new coach, Rolando Acebal, who renewed emphasis on discipline, rigor, toughness. Officials also stressed recruiting and scoured the island for new talent. 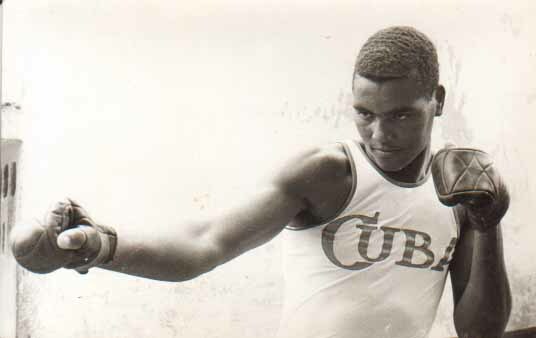 Savon, who along with countryman Teofilo Stevenson, is one of only three boxers to have won gold medals at three Olympics, personally scouted his native province of Guantanamo. The result is a promising new crop of youngsters who so far have done well. Cuba took two gold medals and a silver at the World Championships in Baku, Azerbaijan, last July. In the fall, it reclaimed bragging rights in the Americas, winning eight men’s titles out of nine possible at the Panamerican Games in Guadalajara, Mexico. The big test comes this summer at the London Olympics. “There has been good work,” said Stevenson, now a vice president of the Boxing Federation. “We have several possibilities for medalling, including Julio Cesar La Cruz,” a 22-year-old light heavyweight who was one of the champions at Baku. Beyond London, the future rests firmly in the gloved fists of the kids duking it out in the Rafael Trejo gym. The 9-10 age class is a pilot program in just Havana for now, but officials say it could be rolled out to the rest of Cuba, where 11-12 is currently the youngest level of competition. Outsiders said that could give Cuba an edge over places like Puerto Rico, which holds fights starting at 11 years old, and Spain, where boxers start competing at 15. At 13 years old, Dayron Valdes, last year’s Havana regional champion in the 88-pound (44-kilo) weight class, is already a veteran of youth boxing. He said his goal is to follow in the footsteps of his idol, La Cruz, representing Cuba on the winner’s dais while fighting with honor and style. Associated Press writer Jorge Sainz in Madrid contributed to this report.